As soon as the air turns crisp in the Rocky Mountains, you will find me in the kitchen baking. Usually it’s something practical, like cornbread or biscuits for dinner. But sometimes I’ll feel particularly soft-hearted towards my children and bake up a batch of treats–oatmeal cookies, carrot cake, or banana bread. I don’t do this very often. Mostly because, with 5 children snacking on them, a batch of cookies lasts about an hour in my house. This skews the cost-to-benefit ratio way out of proportion. The other reason I don’t do much treat baking, is because it’s always a dilemma for me to find treat recipes that line up with our family’s whole foods diet. I don’t get bent out of shape using white sugar and flour for those special occasions like birthdays and….well, birthdays. But for every other day of the year (including Christmas) I look for something more wholesome. Still treat-worthy, but not a sugar bomb. This type of recipe has been hard to come by. 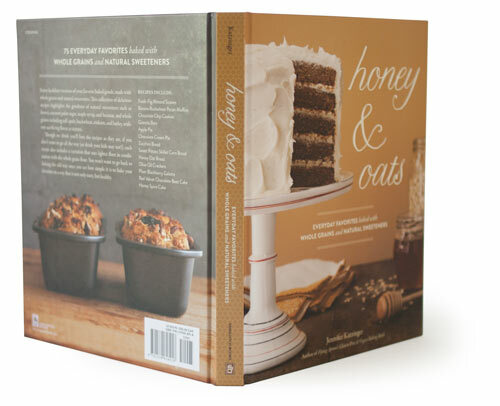 Revolutionizing my 2015 holiday baking season is Jennifer Katzinger’s book Honey and Oats. Sasquatch Books was kind enough to send a copy for me to test out (which basically means I make a mess of it) and a brand-spanking new, un-splattered, non-dog-eared copy for a lucky winner. Lucky you! The subtitle for Honey and Oats pretty much says it all: Everyday favorites baked with whole grains and natural sweeteners. Jennifer’s baking mission is to “explore traditional [recipe] favorites and alter these inspiring desserts, pastries, and breads to replace white sugar and flour with unrefined natural sweeteners and whole-grain flours that are full of nutrition and often more easily digested.” She explores a wide range of whole grain flours (including oats, einkorn, wheat, barley, buckwheat, spelt, kamut, teff, and tapioca) and a variety of wholesome sweeteners (honey, maple syrup, coconut palm sugar, and sucanat). Her introduction includes an informative profile of each grain and sweetener, emphasizing its history, process, flavor profile, and nutritional content. This book is an excellent option for those of you looking for healthier alternatives to your holiday baking. Jennifer covers the full gamut of baking — cookies and pies, yeast breads and quick breads, sweets and savories, simple and fancy, gluten free and glutenous. The Red Velvet Chocolate Beet Cake is begging to be the star of my household’s Christmas dinner. But there is also the Pecan Honey Pie to consider. If you have houseguests coming you’ll be grateful for a loaf of Pumpkin Pecan Bread, or if you’re having a holiday open house the Olive Oil Crackers are just the thing for your snack table. Jennifer starts each recipe in a predictable and comfortable place, something approachable and easy for home-bakers to recognize — like banana muffins, or pumpkin bread. But then she tweaks the ingredients, swapping out the white flour and sugar for healthier and more flavorful alternatives. The strong and earthy Banana Buckwheat Pecan Muffins, for example, are mixed up with buckwheat flour and coconut palm sugar and are an excellent accompaniment to your morning coffee. The Barley Walnut Boule combines barley flour and honey for a mellow, nutty flavor perfect for soup night. If you’re new to whole grains, or are a little on the fence about replacing your all-purpose flour with teff and barley, don’t worry. Jennifer has made it easy for you to dip your toe into the whole-grain waters, too. Each recipe has a measurement for a full measure of the whole grain flour as well as an option to replace some of the unfamiliar flour with an all-purpose whole wheat or einkorn flour. 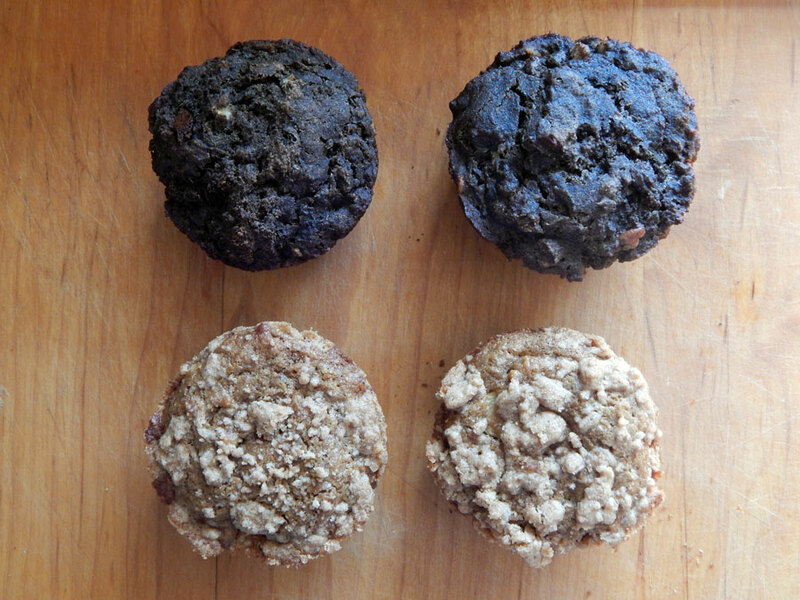 For example, your Mexican Chocolate Spice Cookies will taste much more “kamut-y” if you use all kamut flour. If that makes you nervous, just replace half of it with whole-wheat flour. From my home-kitchen testing, Jennifer’s recipes receive full points for flavor. 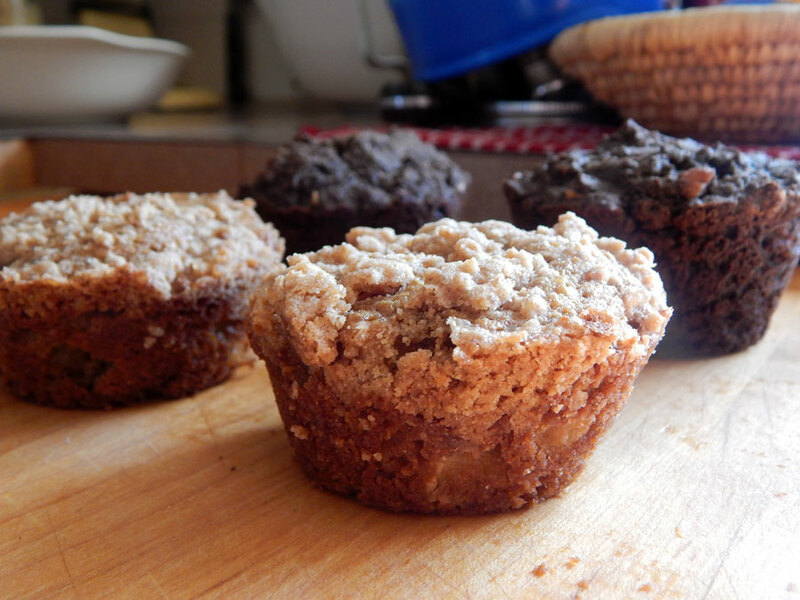 I tested out two muffins on my kiddos (Banana Buckwheat Pecan Muffins and Pear Ginger Muffins with Streusel Topping) and both of them received rave reviews. The Gingerbread Cake was so delicious that it just may replace my usual holiday recipe. Sasquatch Books has generously allowed us to share the recipe with you below. I was super-excited to find a whole-grain, maple-sweetened recipe for a rollable cookie dough. Jennifer’s Animal Crackers are the answer to my cut-out cookie woes! Every year the kids want to roll out dough and use Christmas cookie cutters to make fun shapes, but I’ve never been able to find a rollable dough without white sugar and flour. We can’t wait to give these a try! From a technical stand-point I had some issues with a few recipes. One of the muffins called for creaming cold butter with the sugar, which (predictably) resulted in a flatter muffin with less rise. And when we tried baking the gingerbread in mini-bundt pans as the recipe suggests, the extra batter bubbled over the top and made a giant mess in the oven. These are not insurmountable issues. And the recipes are so unique and flavorful that I still whole-heartedly recommend the book. Just consider this fair warning to use common sense when following the recipes and keep an eye out for minor glitches. We realize that not everyone lives in a place where the local supermarket carries teff flour and coconut sugar. What’s the fun in winning a cookbook when you don’t have the ingredients to use it? (Answer: not much) We wanted to know that the lucky baker who wins Honey and Oats is well-equipped to try out any recipe from the book. The good folks at Plan to Eat have assembled 13 different organic flours from Bob’s Red Mill* and 5 different sweeteners** used in Jennifer’s book. From einkorn to teff, and from syrup to sucanat, your whole-grain baking needs are covered! We took the time to source and gather some special sweeteners for you. 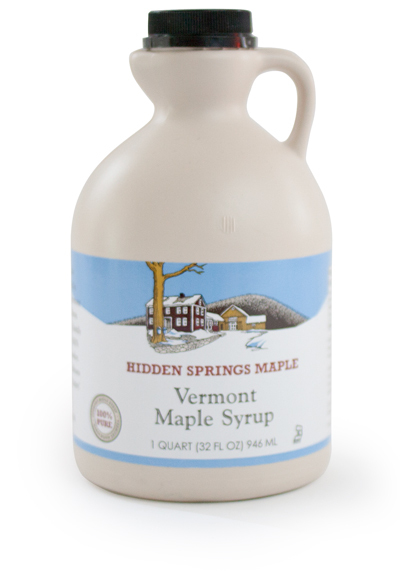 Hidden Springs Maple farm has supplied our giveaway package with an entire quart of its 100% pure Vermont Maple Syrup. Hidden Springs Maple is a family farm that has been in the sugaring business for over 50 years. They produce tasty, high-quality maple syrup. You can find some really fun photos from the 1970’s of the CEO loading his horse-drawn wagon with syrup on their website. We’re giving it to you for baking, but we understand if it ends up on your pancakes. We also visited our own local honey producer, Copoco’s Honey, for a pint of its Seasonal Wildflower honey. You could bake with it, but it’s raw and unfiltered, so you may just want to drizzle it on your Sweet Potato Skillet Corn Bread. Either way, it’s yours to enjoy! * Organic Buckwheat Flour, Barley Flour, Organic Whole Wheat Pastry Flour, Spelt Flour, Light Spelt, Organic Regular Rolled Oats, Organic Kamut Flour, Teff Flour, Tapioca Flour, Fine Grind Cornmeal, Almond Meal / Flour, Organic Unbleached White All Purpose Flour, Organic Whole Wheat Flour — $59 of grains from Bob’s Red Mill. Awesome! ** Honey, Maple Syrup, Coconut Palm Sugar, Molasses, Sucanat — $70 of sweeteners from mostly local companies. And since this is a holiday baking giveaway, we thought that the prize package should also include something fun, yes? A few holiday baking items that might not already be in your cupboard? 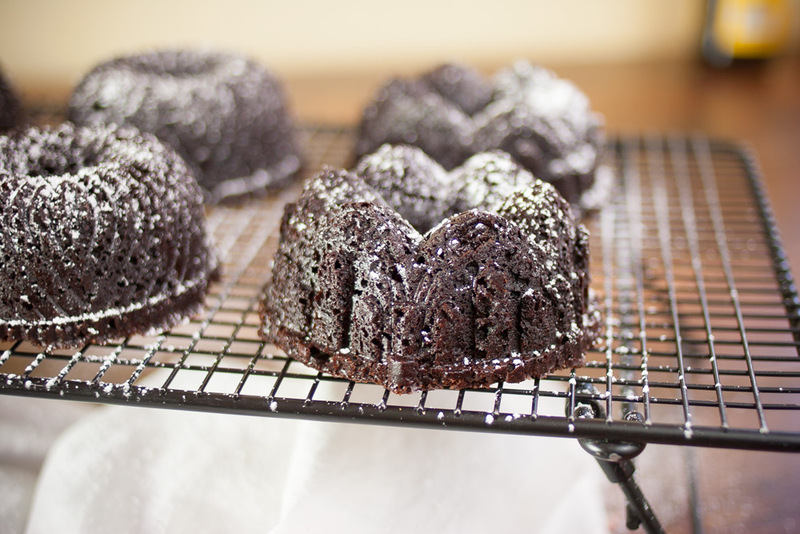 Jennifer’s Gingerbread Cake is so much more festive when baked in a mini-bundt pan. 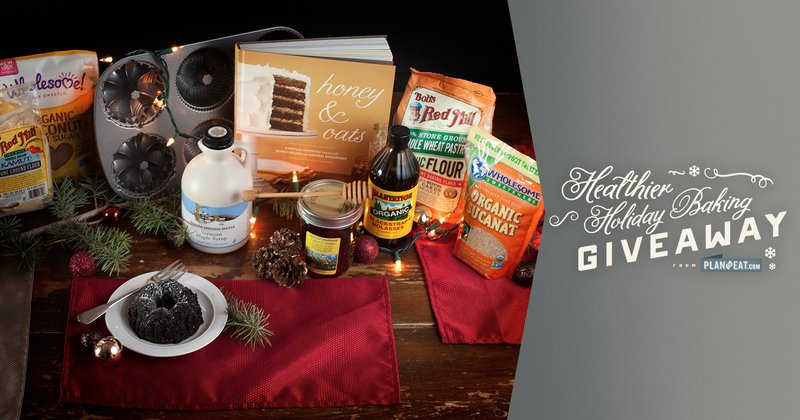 Just to gild the lily, we’re including one with the giveaway package to push your holiday baking to new levels. All of these swoon-worthy items will arrive at your doorstep packaged in one of our brand-spankin’ new Plan to Eat canvas shopping bags. We evaluated dozens of tote bags before finding just the right one. Not too deep, not too shallow, not too large, not too small…. It’s just the right size for a gallon of milk and some fresh produce. And to top it all off, we’re including a one year Plan to Eat subscription! You can use this to start a new account, extend your current subscription, or give it to a friend. Preheat the oven to 350 degrees F. Lightly grease and flour a 13×9″ baking pan. Strain the raisins and set them aside. In a medium bowl, combine the flours, cocoa, cinnamon, ginger, baking soda, baking powder, salt, cloves, and pepper. In a small bowl, stir together the molasses, maple syrup. water, and oil. Stir in the fresh ginger. In a large bowl using an electric mixer, or in the bowl of a stand mixer fitted with the paddle attachment, beat the butter on medium speed until creamy. Add the eggs one at a time, mixing well after each addition. Add the dry ingredients to the butter alternately with the molasses mixture in 3 additions, mixing until just combined. Fold in the raisins and orange zest. Pour the batter into the prepared pan. Bake until a wooden toothpick inserted into the center of the cake comes out with a few crumbs, about 45 minutes. Let the cake cook for about 1 hour before serving. In case you have not already noticed, the Plan to Eat website, including our desktop app, blog, and customer support site, has a new paint job! If only there was a magical formula for getting a nourishing, easy dinner on the table! Well there is!